Calgary Criminal Charge? Let Greg Dunn Help You! This confidential information will be forwarded for Greg's immediate review. If you've been charged with any crime in Calgary, or anywhere else in Alberta, Greg Dunn is the criminal defence lawyer you need to speak to. If you have been charged with a criminal offence and want the best representation available, contact Greg Dunn. Mr. Dunn is a versatile lawyer with a reputation for being a straight-shooter who is a fierce courtroom opponent. He will argue your case with conviction, ensuring that your side of the story is told, and told well. 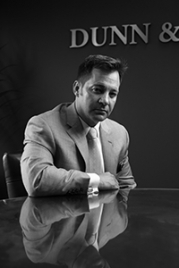 Mr. Dunn has been practicing criminal law for the past twelve years, and runs his own firm where he is managing partner. He knows what it takes to run a reputable and highly successful criminal defence firm: leadership, hard work, and a deep understanding of how the law works. Mr. Dunn is heavily involved in the criminal justice community. He trains other lawyers and police in criminal law matters, and is often consulted by the media for his opinions. His father was an RCMP officer. Mr. Dunn will take on the establishment on your behalf, and has a track record of victory where it seemed that there was no hope. Criminal defence requires clarity of thought, and the ability to deliver arguments with conviction and plausibility. Mr. Dunn knows how to conduct a case – he feels most at home in the courtroom, and will walk with you every step of the way. It is important that the strengths and weaknesses of your case be accurately accessed, and that that information is conveyed to you in a clear, direct fashion so that you are able to make decisions on your own behalf. Greg Dunn makes it a priority to keep his clients informed, and to provide them with options. He will ensure that you know what is happening at every step of the way, and that you don’t become lost in the confusion of the court process. Maintain your sense of dignity and autonomy while being defended by an assertive, successful attorney like Mr. Dunn. Mr. Dunn’s career history includes being named as one of the “Top 40 Under 40” for his contributions to excellence in criminal law. He has represented clients in high profile cases throughout his years as an advocate. Get Mr. Dunn on your side, and rest assured that you have hired the best to defend you during what may be one of the most difficult times of your life. Call now.